Everybody keeps telling us that global growth is very fragile. The advanced economies haven’t really recovered from the financial crisis and even the emerging economies have slowed. But is this narrative true? The global bankers’ bank, the Bank for International Settlements (BIS), is rather sceptical about that view. Cast your eyes on chart 1, taken from the recently published BIS annual report. 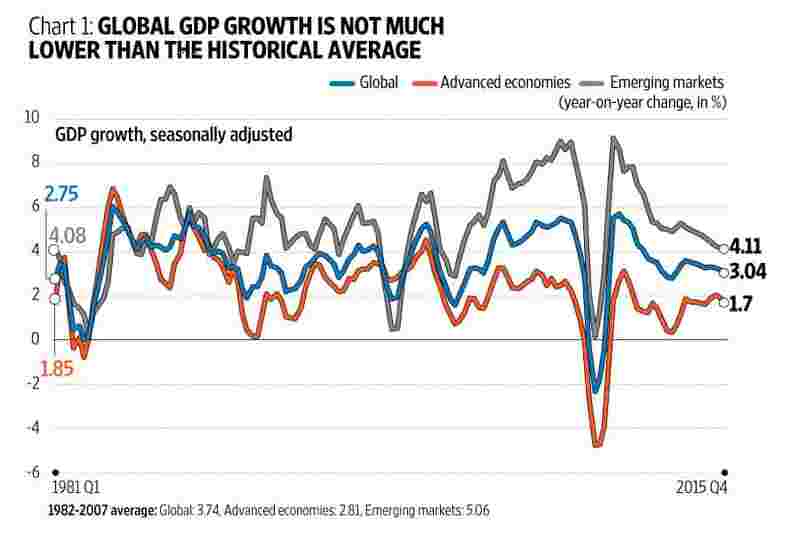 Notice that global growth is not all that much lower than its historical average. It’s higher than where it was during 2001-02 and around the same level as it was in the early nineties. The BIS report says, “growth rates are not that far away from historical averages, and in a number of significant cases, they are above estimates of potential. In fact, once adjusted for demographic trends, growth per working-age person is even slightly above long-run trends. Similarly, unemployment rates have generally declined and in many cases are close to historical norms or estimates of full employment". 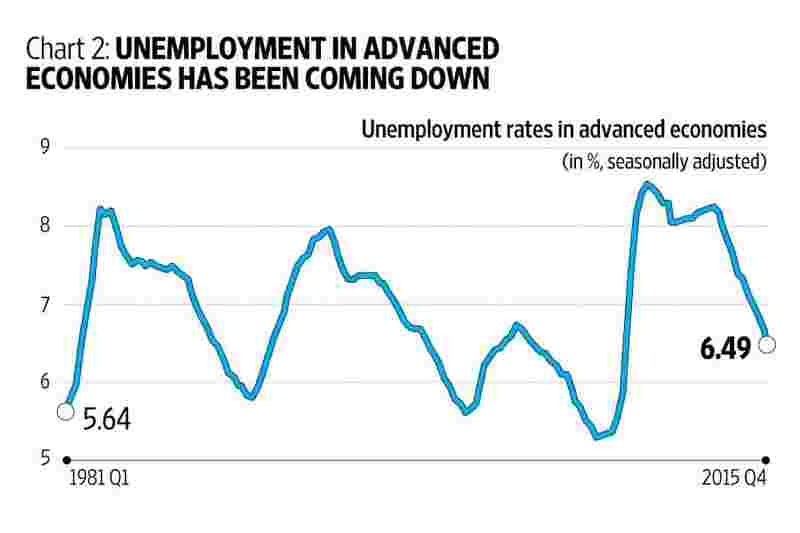 Chart 2 shows that unemployment rates in the advanced economies are now well in line with historical averages. Why then the angst? Perhaps one reason current rates of growth are seen as unsatisfactory is because we compare them with the boom years before the crisis. But that would be the wrong thing to do. BIS also points to the fact that potential growth rates are now lower, not least because of the greying of the world population. Chart 3 shows the growth in the population of working age in two groups of economies. Note that the working-age population growth is now negative for the group comprising the advanced economies, China and some eastern European economies. 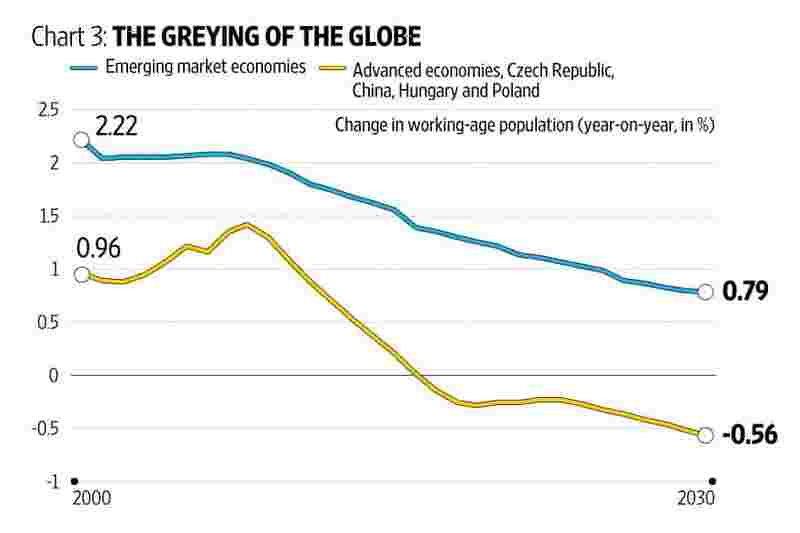 For emerging markets, growth in the working-age population has also fallen substantially. Given these trends in working-age population, potential growth rates also need to be revised downwards. One way of finding out whether growth is indeed at or near potential is to check whether the GDP per working-age person is in tune with historical averages. Chart 4 has the details. In 2015, according to BIS calculations, global GDP growth per working-age person was 2.63%, higher than the average of the 20 years preceding the financial crisis. 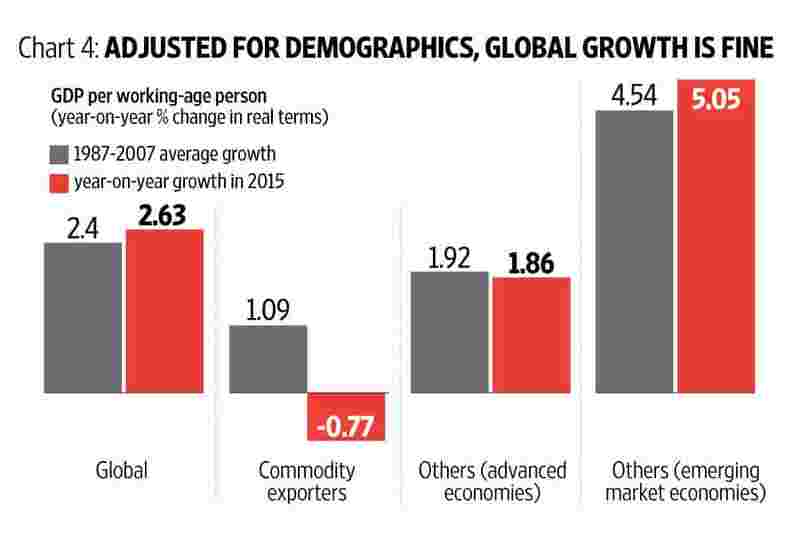 Commodity exporters’ GDP growth per working-age person is negative, in view of the shock to their economies from the plunge in commodity prices. But the other emerging market economies have done better than their historical average, while the advanced economies haven’t done too badly either. There is, of course, another way in which economies can grow more rapidly in spite of lower population growth and that is by increasing productivity. But productivity has been slowing in the advanced economies since well before the financial crisis. 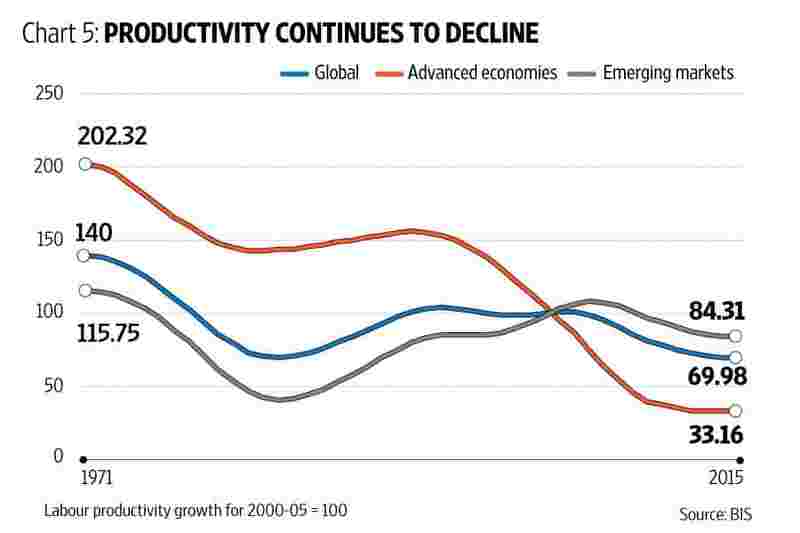 As chart 5 shows, productivity growth has slowed in emerging markets as well. What are the reasons for the productivity slowdown? The BIS report says, “In addition to the impact of lower investment, some evidence suggests that one factor may be the persistent impact of the credit boom induced misallocation of labour into weaker productivity growth sectors. In addition, the current exceptionally easy financial conditions can create incentives for banks to evergreen loans, keeping otherwise unproductive firms alive. Those conditions may be detrimental to a swift reallocation of capital and labour, and distort competition across the economy." Whatever may be the reasons—there are a host of them—the point is that potential global growth is now weaker than before the financial crisis. And according to BIS, growth is not that far from historical averages. The big question then is: is it necessary to keep interest rates so low—or indeed, negative—in the advanced economies to stimulate growth? Might it not be that lower growth is the new normal and that keeping interest rates so low for such a long period breeds all kinds of misallocation of capital, which has been BIS’s point of view all along? And finally, and perhaps most worryingly, central banks may have boxed themselves into a corner because the prolonged period of low interest rates has led to investors taking more risks in a search for higher returns. They will now have great difficulty withdrawing the monetary stimulus simply because financial markets could be severely damaged when their dose of monetary methadone is taken away. Manas Chakravarty looks at trends and issues in the financial markets. Comments are welcome at capitalaccount@livemint.com. To read more Capital Account columns, click here.